“Salt and light.” That is what Jesus says about his disciples. 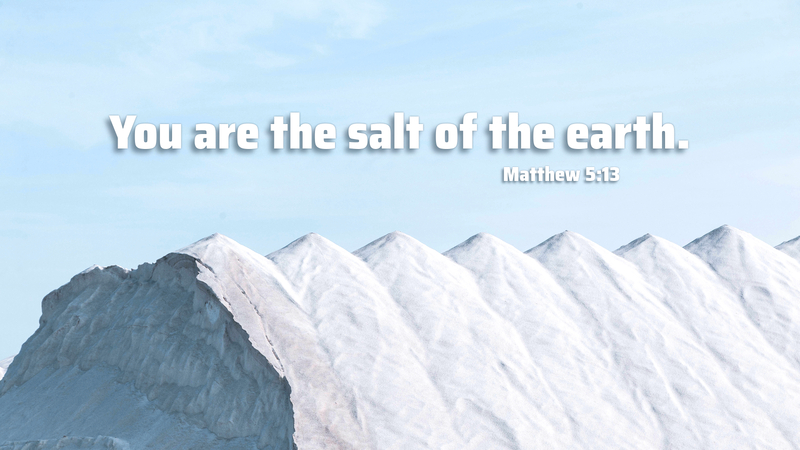 “You are the salt of the earth and light for the world.” Think about it for a minute. Because of our love for Christ, and because of his love for the world, we get to be salt; we get to be that which provides flavor, that which preserves. We get to be light that shines as a beacon to the Lord of salvation. What an incredible gift. Because God has claimed us in baptism, forgives our sins, and poured out his Holy Spirit upon us, Christians are made salt and called to season the world with the gospel. The light of our faith is made visible through our words and deeds and made to shine into the darkness of a world longing to know Christ. There are so many opportunities to show the love of Christ Jesus to a hurting world. Following our Lord, we are equipped and empowered to feed the hungry, provide aid to the poor, shelter to the homeless, and bring good news to the lost so that they may be found in Christ Jesus. “Salt and light.” That is what Jesus says about you. Go in peace; serve the Lord. Prayer: Lord of all, may the words of my mouth and the works of my hands bring glory to your name. Amen.